Our Power Lock Repair provides impeccable power lock repair services to those in need in the Inland Empire. Our Auto Power Lock Repair service call separates us from the pack. 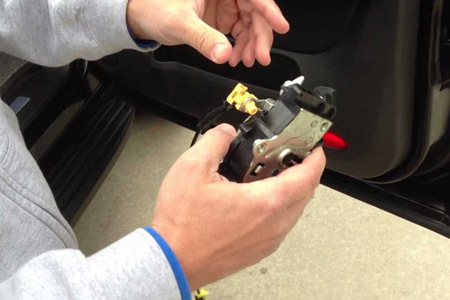 Are the power locks failing on your car door? If they are, it can be a major irritation not only to you but also to other passengers trying to get in or out of your vehicle. Anytime you can call us and our power lock repair service men will reach you in no time. We have the team of best technicians and service men. And the apparatus used are the one with best quality. Faulty locks provide thieves with opportunity and increase the likelihood of injury in the unfortunate event of an accident. Fortunately, our staff is equipped with the right tools for repairing a central locking system. Give us a call and let us take a look at the motors and control switches that control these power options. Our expert technicians will get them fixed and your vehicle back in a state quickly. We repair or replace faulty parts with top quality parts that are backed with lifetime warranties in most cases. From enabling us to prepare entry to our vehicles minutes before we arrive to simultaneously unlocking our doors to let passengers in or out, there’s no doubt that our power locks improve our automotive experience greatly. We repair or replace faulty parts with top quality parts that are backed with lifetime warranties in most cases. Our experts will get you fixed up in no-time.